But brothers and sisters if it was necessary and more useful for us for Lord Jesus Christ to stay on the Earth, he would stay. We know His endless love for us, we know his sacrifice for us. We have to believe that if it was better for Him to stay forever on the Earth, He would have done just that, but he ascended, and that means that it better for us that He left the Earth. Why? Because he wanted to destroy that spiritual wall that separated Heaven from Earth, and to pour on the Earth those merciful gifts of the Holy Spirit which though was designed for humans, they were not yet made available. All barriers to the reconciliation of humans with God were removed when our Savior ascended into the Heavens and he sent to the earth heavenly treasures, prepared since the creation of the world, in the form of the Gifts of the Spirit. Jesus Christ says to his disciples in John 16:7 “But very truly I tell you, it is for your good that I am going away. 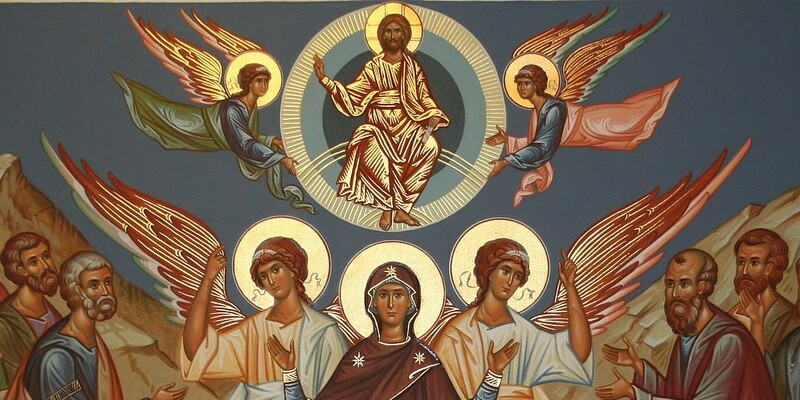 Unless I go away, the Advocate will not come to you; but if I go, I will send him to you.” He left and on Pentecost he sent the Holy Spirit who came down upon the apostles and to those that believed (Acts 2:1-4). It is this Holy Spirit who now resides in the Holy Church, and his gifts we are given in the Holy Sacraments. But that “home” was closed until we were redeemed by Jesus Christ. The Savior with his glorified (though human) body ascended into heaven; he went home to his Father. Brothers and sisters, lets live well, let us work toward receiving those mansions. Let us work to show the love of our Lord to the world, so that we, too, may ascend to heaven to be with our Lord. With thoughts, with feelings, with wishes, with aspirations, with acts, more and more to lift up high, let us strive to the pure, the holy, the heavenly, and the divine.